At the time of writing over half the ticket allocation has been sold! Guild Ball Playtest Events will start at 9am and conclude at approximately 6pm. Attendees should expect to be able to play at least three games during the day with all playtesting materials being provided for you. However, it is a good idea to bring your own gaming models, measuring tools, tokens, and anything else you usually use during games of Guild Ball with you. Tea, coffee, soft drinks, and snacks will be available throughout the day. A free lunch is included in the price of your ticket, please make sure to let us know about any special dietary requirements. Additionally, our onsite store will be open for the duration of the day in case you feel like picking up any of our latest releases! 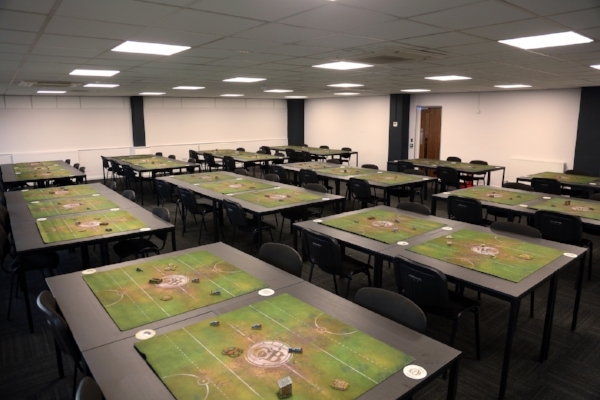 Because these events are about testing models that are unfinished, all attendees must sign a Non-Disclosure Agreement (NDA) before being allowed on the tour or to see any of the playtest rules or models. Signing the NDA means that you aren’t allowed to discuss any unreleased rules or models seen during the day until they have been shown to the public by Steamforged Games. So, no going home and posting everything you found out on a forum, blog, or social media! Additionally, there will be no mobile phones or other recording devices allowed during the Playtest Event. Any mobile phones or recording devices must be stored in our secure lock-box for the duration of the event to keep them safe.